All children are interested in practical activities, such as the tasks they see accomplished at home, and which they wish to imitate, e.g. : pouring, polishing, washing and squeezing. 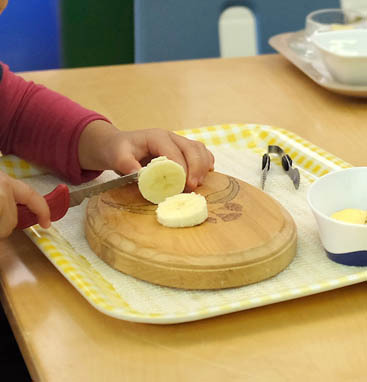 These Practical Life activities are satisfying in themselves for the children and also support the development of concentration, orderly work patterns, hand-eye co-ordination, gross and fine motor skills – all essential skills for writing and reading. In addition, children learn to care for themselves and their surroundings, and how to behave with grace and courtesy. The Sensorial materials break down abstract concepts into concrete activities. Concepts such as dimension, colour, form, texture, volume, weight and shape are easily understood using materials that clearly isolate each concept. Children spontaneously choose these materials because they fulfil their desire to explore their world through all their senses. The development of writing is enhanced through manipulation of these materials. The Mathematics area also introduces abstract ideas and relationships through the use and manipulation of concrete materials. For example, through the materials a child can physically see and feel that “1” is smaller than “1000”. The concept of “10” is emphasised in many materials, as our whole number system is based on this. 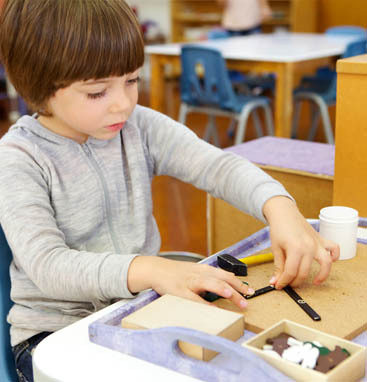 The child is introduced to the functions and operations of numbers, learning to add, subtract, multiply and divide, all through the use of the unique Montessori materials. The Language area supports the child to distinguish the sounds that make up his language, and enables practice of the fine motor skills already developed. The Sandpaper Letters allow children to “feel” the letters, and the Moveable Alphabet allows children to make their own words and stories even though they may not yet be able to write clearly. The child is inspired to use a pencil to create more permanent stories. Other activities are available which present the intricacies of non-phonetic spelling and grammar. The children begin to know what they have written and begin to read back their own stories. They may come to reading by themselves, having already absorbed the many keys. The Cultural area includes natural science, geography, history, art and music. The children use puzzles maps and flags to learn about their own and other countries. Music is explored both by participation and listening. A variety of art materials is available at all times – children may choose activities such as drawing, painting, pasting or clay. Nature is explored both in the classroom and in the school garden. Each term external visitors are invited to share areas of special interest with the children and the older children have excursions to places of interest.